Grave Encounters: What is so fascinating about the burial grounds of Green Point, Cape Town? In the mid-19th century the early inhabitants of Hermanuspietersfontein called it “Klip Kop” – an isolated hill rising some 75 metres above sea-level on the otherwise flat plain on which their village lay. The origin of the name was fairly obvious to anyone looking at the koppie. It comprises two parts: a sloping lower area, gradually descending to about 40 metres above sea-level, with luxuriant fynbos growth and dotted with huge rocks and stones. These had obviously been eroded away from the steep, almost perpendicular cliffs of the upper part of the koppie, leaving a surface of grey stone. Either the cliffs or the fallen rocks or both could have been the origin of the term “Klip Kop”, which remained the name till well into the 20th century. However, today everyone knows the hill as “Hoy’s Koppie”. Why is that? Sir William Hoy was one of the most charismatic figures in Hermanus history, a Scottish-born head of the Cape and South African Railways in the 1920s who fell in love with Hermanus and visited the village repeatedly for the fishing and the relaxed and restful lifestyle. He regularly stayed at the Marine Hotel. One of his greatest pleasures was to climb Klip Kop with his gillie, Danie Woensdregt, of an evening, and look out over Walker Bay and plan the next day’s fishing. On his death, his wife, Lady Gertrude Hoy informed Woensdregt that Sir William had expressed a wish to be buried at the crest of the Koppie. Woensdregt made arrangements, including the construction of the first formal path on the Koppie. Later, Lady Gertrude was buried alongside her husband. And so “Klip Kop” became “Hoy’s Koppie” and both graves remain preserved at the highest point of the koppie. The dominant explanation for the existence of Hoy’s Koppie is that it was created by wave action cutting away softer material around a core of harder sandstone. As the shoreline receded over time the core of hard sandstone was left standing. The koppie may be visualised as a tall, vertical headland of harder material, isolated from the surrounding plain by wave action, and left standing once the sea drew back. In this sense it is like a tall Gearing’s Point. It is primarily composed of quartzitic sandstone, approximately 440 million years old. 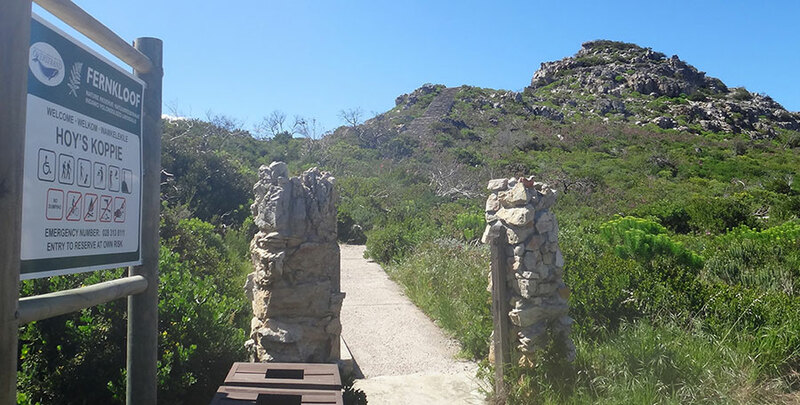 Residents and visitors to Hermanus have long enjoyed walking the paths on Hoy’s Koppie and recent improvements to the paths by the Cliff Path Management Group and the Municipality have made the outing even more enjoyable. Since 2008 the main contour path that takes you right around the Koppie has been widened to 1.2 metres and provided with a permanent surface of exposed aggregate concrete to make for easy walking in all weathers. The original entrance on the north side has an improved parking area and the path up to the contour path has likewise been given a permanent surface. This path and the contour path are now fully wheelchair friendly, giving a total 1.2 kilometres of wheelchair friendly paths. Because of the terrain in the immediate vicinity of the Hoys’ graves, steps have had to be retained, but this 180 metre stretch has also be repaired and modernised. A second entrance to the Koppie has been created on the south side, with steps and a boardwalk rising from the car park adjacent to the United Church and the Primary School. Visitors can enjoy stunning views of Hermanus, the Fernkloof Mountains and Walker Bay from various points along the paths, through the best view still remains form the top of the Koppie. Natural fynbos grows in abundance on the lower slopes, especially since a fire in 2008 worked its usual magic in taking out old growth and stimulating the appearance and germination of species not seen for a long time on the Koppie. Because of the orientation of the Koppie different varieties of fynbos are found on either side of the Koppie. This is the second in a series of article about historical sites in Hermanus, produced by the Hermanus History Society and written by Robin Lee. If you are interested in the Hermanus History Society please contact Robin Lee on (028) 312 4072 or robinlee@hermanus.co.za.